The mountain is for everyone. We share it to you ! If rock climbing would have been developed much earlier in Mexico, as in Europe, surely there would be so many routes that one would have to dedicate over a lifetime to climb them all. Mexico is rock quality rich, either for sport, traditional or big wall climbing, even having monoliths almost a thousand meters high. The mexican climber is the one who, without question, has provided the most to the rock climbing development in Mexico since the past century, but it?s worth to say that foreign climbers also have helped all this great projects (mostly from United States), developing very important zones as Potrero Chico or El Salto, near Monterrey, in the Nuevo León state. Talking about sport climbing and bouldering, today there are quite a lot of developed zones through all the country (near 300! ); however, mexican climbers that dedicate their effort in creating new routes are reduced to only a few numbered group. And it isn?t that big rock walls are missing: La Huasteca, Potrero Chico, the big walls in Chihuahua as El Gigante or the wall in Basaseachic waterfall, the Sierra de Durango or El Gran Trono Blanco in Baja California Norte already offer several journeys to know a bit of the great mexican walls. Also, it?s surprising the big amount of virgin spots that exist through all the country, still waiting for a first climb. Product of dispersion and, many times, the lack of knowledge and communication, climbing in Mexico advances at a lower rate than it really could. The project of the Rock Climbing in Mexico guide, by As de Guía, has the objective to deliver that knowledge to everyone that seeks to use it for good reasons, either it is just to enjoy a great climb or to collaborate with the development of new routes that will give shape to the future of climbing in the mexican territory. The exotic North American country Mexico, has a land area of nearly 2 million square kilometers (about three times the size of Spain), and in recent years has seen a rapid increase in both the number of climbers and climbing areas. Mexican climbing, although relatively unknown for the vast majority of foreign climbers, has a huge amount of excellent rock climbing areas with exceptional sport crags, gorgeous, slender walls with multi-pitch routes of striking beauty and magical bouldering. The type of rock is very variable across the country with limestone, rhyolite, basalt, tuff, granite and sandstone. towns like Taxco, Oaxaca, San Cristobal de Las Casas, make the trip to the south of the country enchanting. In the center of the country, the development of climbing areas is higher than in the south, since the concentration of large cities like Mexico City, Puebla, Pachuca or Guadalajara. In this central area there is a very high concentration of sport crags, a number of trad climbing areas, bouldering areas and some walls with multi-pitch routes. In this central area you will find the highest volcanoes in Mexico (over 5000 meters), so it is advisable to combine the rock climbing trip with the ascent of at least one of the volcanoes. In fact it is possible to climb some of the boulders spread at the plateau below the Iztaccihuatl volcano at 4000 meters or even climb some of the sport and trad routes on the walls on the way to the Summit (Murallas Rojas). Also the good weather in Mexico is a bonus when visiting the country. The excessive cold doesn’t exist, but rather may feel too hot in summer, but there is always the possibility to climb in the shaded areas. for the experienced big Wall climbers in all of the world. It is noteworthy that in addition to the already existing rock climbing areas, the potential is enormous in Mexico. You could spend more than a lifetime fixing new routes and sectors. The quantity of rock, especially in the northern states like Chihuahua and Nuevo León, is almost infinite. The Petzl Rocktrip was held here in autumn 2010 and the event visited the sport crags of Chontacoatlan (Guerrero) and Jilotepec (Estado de Mexico). The world’s best climbers were impressed of the quality of the routes and the huge potential of the country. With the information gathered in the two new rock climbing guide books, covering all of Mexico and documenting around 130 climbing areas, people will enjoying Mexico’s amazing rock. Mexico has more than 300 climbing areas! The following are some of the most worthy of note and rewarding. rock is limestone of exceptional quality and the routes generally feature technical face climbs and several overhanging walls with tufas as well. It is undoubtedly one of the most visited areas of the country. EL SALTO (Nuevo Leon): Another excellent area near the city of Monterrey. It is located in a narrow and impressive canyon and has several sectors. Two of them, Las Animas Wall and La Cueva del Tecolote are a must. Along with the excellence of the routes, the natural setting is gorgeous. PUENTE DE DIOS (Nuevo Leon): This area is located at the south of the State. It is a prominent bow, which houses exceptional overhanging and high quality routes. LA HUASTECA (Nuevo Leon): This is one of the most impressive limestone havens of the country. La Huasteca is located behind the city of Monterrey in Cumbres de Monterrey National Park. Here you will get a big amount of face climbing sport climbing sectors as well as impressive walls up to 500 meters high with terrific multi-pitch routes. The area has a huge potential as there are quite a few valleys filled with limestone spires and walls. La Huasteca is one of the chakras of the earth for the Huichol community, who have come to this land since ancient times to worship their gods communing with peyote. It is definitely one of the most fascinating and wildest rock climbing places of the country. Do not miss it. MONTEMORELOS (Nuevo León): A newly developed area which houses overhanging, premium routes, featuring tufas and stalactites. La Cueva del Oso (Bear Cave), apart from other recently developed areas, will certainly be one of the main sport climbing destinations of the northern territory. The potential of this place is enormous and it also located inside the Cumbres de Monterrey National Park. The area is in a continuous process of development. BASASEACHIC (Chihuahua): This magic place is a stunning semi-alpine spot with cliffs and vertical walls, which will delight bold climbers. Basaseachic is known for hosting one of the longest and most famous sports climbing routes of the world, Logical Progression, located on the impressive west face of El Gigante. It has 1000 meters of length on excellent rhyolite. El Gigante is definitely the Colossus of Mexican Big Wall climbing. It owns eight great routes from mixed climbing, aid and pure sport climbing. excellent bouldering areas and various sport climbing sectors like Rancho San Lorenzo with high quality routes on short walls filled with pockets. PEÑOLES (Chihuahua): The Mexican gem for bouldering and one of the world’s top destinations. This amazing spot is located on a desert plateau filled with hundreds of huge granite blocks with a unique texture and surprising shapes. Boulder problems here are just fabulous and some hard sport routes exist. is a granite paradise near the border of the USA. Canyon Tajo is composed of beautiful granite domes which are filled with many excellent mixed, trad and sport routes (these last ones mostly on slabs). There are many excellent cracks still remaining untouch. recently free climbed by Alex Honnold. The type of climbing of the Great White Throne resembles Yosemite when climbing its cracks but there are even some sport climbing routes as well. CATAVIÑA (Baja California Norte): The beauty of this place is amazing. Here you will find a host of large granite blocks between organ pipes and saguaros (a huge type of cactus). It is heaven for bouldering. Blocks with whimsical shapes plus several sport, trad and mixed routes. It is located roughly half way down of the Baja de California Peninsula. GUADALCAZAR (San Luis Potosi): Close to this town there are several top quality limestone sport crags. The impressive overhanging routes of Gruta de Las Candelas (The Cave of Candles), La Joya del Salitre or San Cayetano are a must especially for the overhanging routes lovers. Tufas and stalactites are the main features of the area. CIUDAD VALLES (San Luis Potosi): This town of the green Sierra Potosina has some interesting developed sectors with nice sport routes although short. There is a beautiful deep water solo area on a river. CUEVA DEL SALITRE (San Luis Potosi): A new area with overhanging routes in a cave near the beautiful and exotic Xilitla. The Neovolcanic Axe crosses through this central part of the Mexican territory so most climbing areas have volcanic rock, either basalt, rhyolite or tuff. There are huge significant volcanoes such as the Pico Orizaba (Citlaltepetl, 5610m), Popocatepetl (5500m) and Iztaccihuatl (5220m). In this central area is where there is the largest concentration of climbing areas across the country, especially sport crags. The amount of rock is high as the number of climbers who have developed many crags especially near the cities of Mexico City, Puebla, Pachuca and Guadalajara. 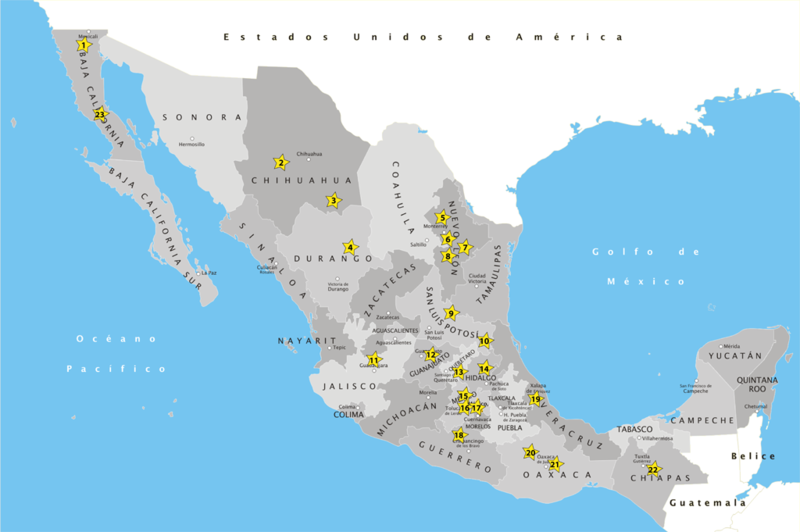 The states of Jalisco, Estado de Mexico, Distrito Federal, Hidalgo, Guanajuato, Querétaro and Puebla are the most significant for climbing. JILOTEPEC (Estado de Mexico): Located about an hour drive north of the capital, it is the most developed area for sport climbing. It has a large number of sectors on good conglomerate and has fabulous routes. It is highly recommended although several routes have chopped edges. The 2010 Petzl Rocktrip was held here. ACULCO (Estado de Mexico): Undoubtedly the best trad climbing area along with La Coconetla (Los Dinamos, DF). It is a canyon with walls filled with cracked basalt prisms of all sizes. A small “Mexican Indian Creek”. It is a great place to visit for jamming lovers. It also has excellent bouldering. LAS MANZANAS (Estado de Mexico): Excellent sport crag with high quality rhyolite, featuring many pockets, crimps and outstanding friction. It is located 3,000 meters above sea level and very close to the city of Mexico. EL ARENAL / ACTOPAN (Hidalgo): Essential sport crag with several sectors. The Cave of El Arenal is a gem for the lovers of the extremely overhanging routes. La Colmena (The Hive) is another good sector with vertical and slightly overhanging routes on a short wall full of curious holes. IXCATAN (Jalisco): For many climbers it is the best sport climbing area of Jalisco. The rock is a reddish sandstone, very solid and with excellent. The quality of the routes here is notorious especially if you like the technical face climbing routes. This sport crag is located near the city of Guadalajara. There are several highly developed sectors so you can climb here for many days. EL DIENTE (Jalisco): This is where some of the first routes of the country were bolted. This beautiful area is composed of a huge concentration of granite boulders of all sizes. It has plenty of small sectors with mostly sport climbing routes, a few trad and mixed routes and excellent boulder problems all around. In fact it is one of the best bouldering areas in Mexico. El Diente is just 10 km from the beautiful city of Guadalajara which has an excellent atmosphere. PEÑA DE BERNAL (Querétaro): This is an impressive granite monolith, one of the biggest granite monoliths of the world that stands amid the arid plains of Queretaro. It has numerous sport routes up to 350 meters long. Most of them are of moderate difficulty although there are also some hard routes as well. It also has several interesting single pitch bolted routes and bouldering. LA BUFA and CALDERONES (Guanajuato): Is an interesting sport climbing area attached to the beautiful colonial city of Guanajuato. It has numerous sectors on the rock band above the city. The rock is a reddish/gray rhyolite. There are some interesting boulders in the area of Calderones, attached to La Bufa. volcanic origin and of great quality. It is a recommended place to climb, especially if you are in the city. The climbing sectors are located around 3000 meters above sea level. LOS PERICOS (Puebla): This highly developed sport crag near the city of Puebla is attractive for climbing and offers quality routes. The main drawback of it are the mosquitoes. crag called Cerro Brujo. The climate in the South is tropical and landscapes are generally composed of wild jungle hills and beautiful beaches on both the Pacific and Caribbean. Bouldering is also possible though nothing comparable with other more northern areas of the country. CHONTACOATLAN (Guerrero): This is one of the most spectacular rock climbing places of the country and the world. This stunning large cave is a temple filled with huge surreal stalactites which defeat gravity. The vast majority of the sustained routes are top quality, long and demand lots of endurance. A gorgeous crag, rivaling the best tufa climbing in the world. DOS BOCAS (Guerrero): A relatively new and evolving crag. Its features are similar to Chonta though with fewer routes. The sector is located in an impressive cave where two underground rivers come to surface. CERRO BRUJO (Veracruz): This is a large limestone wall located in a gorgeous jungle setting. Jalcomulco, the nearest town, is the rafting Mexican mecca. Here you will find some of the largest rivers of Mexico (Pescados river). PEÑA COLORADA (Oaxaca): Great wall of 150 meters of length with magnificent limestone multi-pitch routes. The quality of this red/grey limestone is exceptional and the setting is fantastic. SAN SEBASTIAN TUTLA (Oaxaca): This is the closest sport crag from the city of Oaxaca. This wide and highly developed rhyolite wall has great face climbing routes of all grades. LA MECA (Oaxaca): This wide wave-shaped wall is north oriented which is very rewarding in these latitudes. Most of the routes are of high difficulty, and many are still projects. This crag is also very close to the city of Oaxaca. YAGUL (Oaxaca): Is a small sport crag located near the archaeological site of Yagul and the city of Oaxaca. There are remarkable routes on a slightly overhanging wall full of funky holes. SUMIDERO CANYON (Chiapas): A visit to this canyon is a must, here you will be able to see the magic of Mother Nature. This magnificent canyon has impressive limestone walls on both sides and offer three multi-pitch routes, one of them is 500 meters long. There are a couple of sport climbing sectors. its cultural diversity, geographic diversity (deserts, jungles, wild mountains with deep canyons, beautiful beaches, volcanoes), the must-see archaeological sites and of course the Mexicans. This people are so friendly and cheerful they will make you feel very welcome. Mexico has exquisite food, especially for chili lovers. You can climb in Mexico all year round but during summer the heat can be extreme. It is also the rainy season but you can still climb in the shaded walls and caves. In other words, if your holidays are in summer you can even climb but much more limited. Winter is definitely the best time and the chances are 100%. The driest season is from November to April-May. The new rock climbing guidebooks of Mexico: After five years of hard work the first two climbing guides across the country (North Mexico and Central and South Mexico) are on the market so it is now easier than ever to move and climb around the country with the information you need of the climbs.